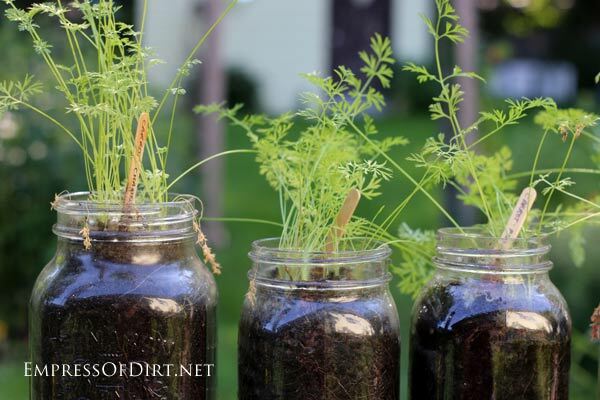 This is a really simple beginner garden project for kids and adults: grow carrots in jars! You can grow tiny (fairy) carrots like I did here, or larger full-size ones—indoors or outdoors. I’ll show you how it’s done. 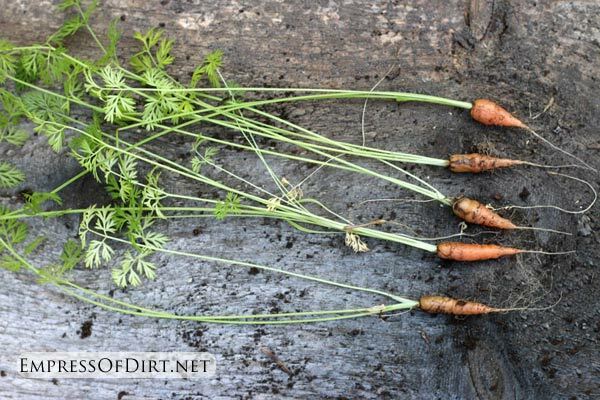 If you’re planting carrots in a garden bed, this tip for making carrot seed tapes will help. We live next door to a daycare and I sometimes hear the kids say they wish they could “grow stuff like that lady does” (as they peek through the fence at my garden). This idea works even if you have no garden, limited space, or simply like to experiment with growing ideas like I do. Any type of carrot seeds will do—they grow small and cute when they’re crowded in the growing space and longer when they have room to spread out. If you just want a quick summary – see the bottom of this post. Jars are not actually a great choice for growing seeds because they have no drainage. 2) kids can see the roots and carrots growing in the soil. 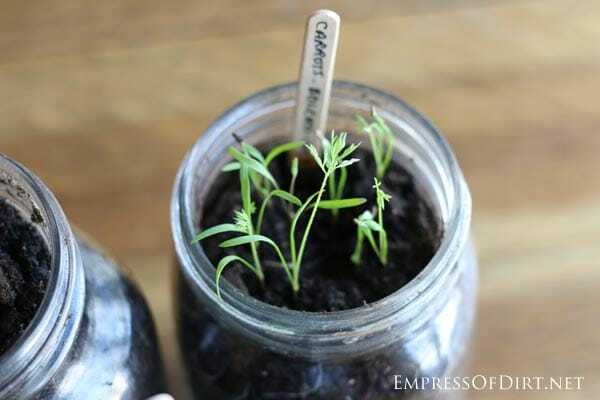 You can also grow carrots in a regular garden container as well. Basically, the more room they have (width and depth), the larger the carrots can grow so long as the soil is clay or compacted. And, providing drainage is the best choice. Unless you like this jar idea, of course. Moisten container soil so it’s damp enough to form a ball when squeezed but not dripping wet. I put some in a bowl and gradually combine with water using my hands. Fill jar with moistened soil. Leave an inch at the top for watering (so it won’t overflow). Sow carrot seeds as directed on seed packet. 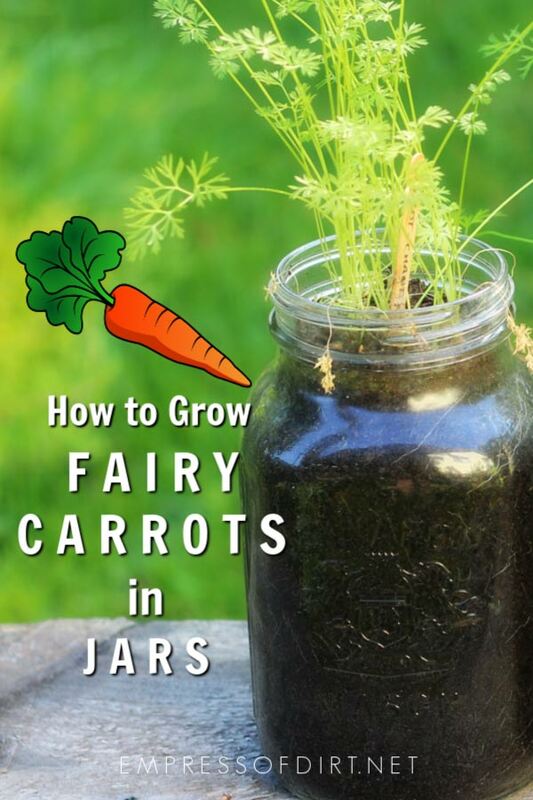 FOR FAIRY CARROTS: sow approximately 10 seeds per jar. FOR REGULAR CARROTS: sow approximately 3 seeds per jar. Do your best to spread them apart – and yes, they’re tiny and hard to manage! Place jar in a sunny location (but not too hot or the soil will dry out). At this point, if you’re growing regular-size carrots and all 3 seeds germinated (sprouted), remove 1, leaving 2 seedlings on either side of the jar. 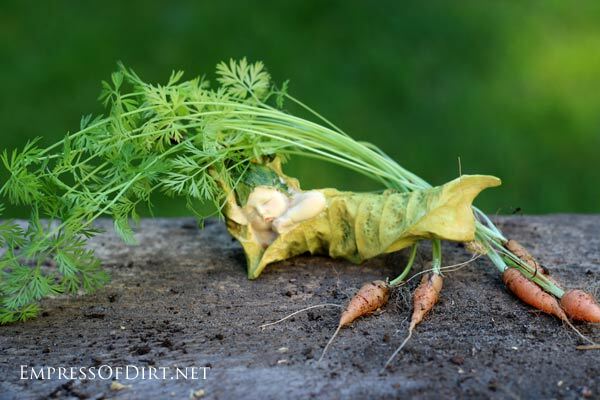 For fairy carrots, leave all of the seedlings to continue growing. Crowding carrots like this stunts their growth but they’re still delicious. Related: How to create your first fairy garden. Water soil as needed. Don’t let it dry out but don’t soak it either. There’s no drainage in the jar so you have to be careful not to over or under water. It’s pretty cool to watch the roots spread through the soil over time. Sometimes a carrot grows right next to the glass so you can really monitor it’s growth. That’s what we call garden geek fun. It varies by type of carrot but many are ready to harvest after 3 months (90 days). Check your seed packet for specifics. To give you and idea of the size, here they are next to the 3″ leaf fairy. Love the sleeping fairy? There’s lots of choices here. 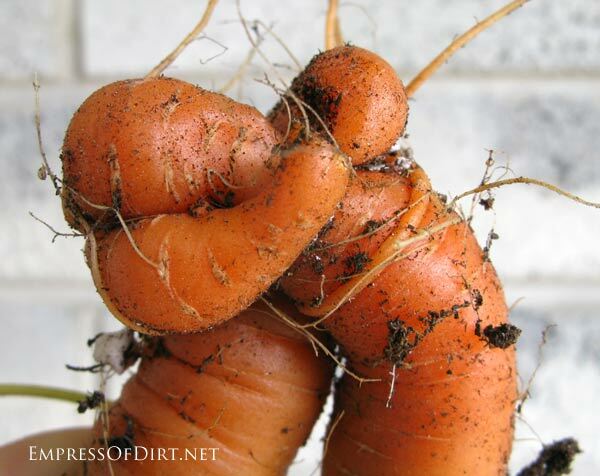 Wash the carrots and eat them fresh from the garden or share them with a veggie-loving pet. 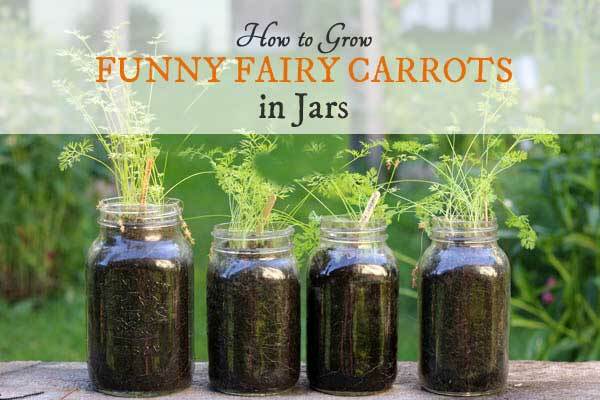 To grow tiny “fairy” carrots, sow 10 carrot seeds in a large mason jar. Use moistened organic container soil made for veggie growing. Grow in warm, sunny location (not hot). Do not thin the seedlings. Do not over-water. Check your seed packet. Most are ready in 3 months. To grow regular size carrots, sow 3 seeds and thin to 2 when sprouted. Rest is the same as above. 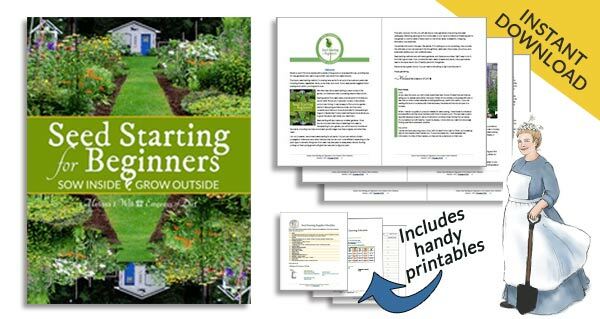 Have fun with your mini carrot growing! How to create your first fairy garden. Create a fairy garden based on a favourite theme. Totally brilliant! And who doesn’t need these little rays of sunshine. Starting ours NOW. Thanks for all of your work and sharing. Hello! By sunny, does it mean it has to be in direct sunlight? I love this idea. Fairy carrots are so dainty, and a nice little splash of green for the windowsill.